The UC300 has a large 3-gallon tank capacity, unmatched flexibility with multiple basket and beaker arrangements, adjustable basket dividers for sorting instruments, and racks to accommodate popular cassette systems. The unique design of the bezel and lid reduces noise levels for quiet operation and limits airborne contaminates. 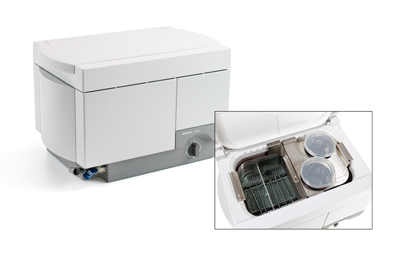 BioSonic UC300R is a recessed 115V model option. The unit mounts directly within the countertop, saving space and maintains organization within the dental office. A remote digital timer is also available.